What is Literary Wonder & Adventure Show? Hilarious exciting antics with your host, Robert Zoltan, and a wise-cracking raven in a magical stone tower that travels to imaginary worlds. Stimulating conversation with authors, artists, editors and others in the field of Fantastic Fiction. Some of the most brilliantly produced full audio dramas you will ever hear. Music by an award-winning composer. Nominated for a Robert E. Howard Foundation Award. Hugo nomination recommendation by Editor Rich Horton. Some say it’s a cross between Mystery Science Theater 3000 and The Late Show. Some say it’s like The Muppet Show on crack. 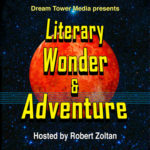 “Dream Tower Media, the mad geniuses behind The Blue Lamp (which Fletcher Vredenburgh called “marvelous… a full sound production, like a radio show ”) have released their new audio series, the Literary Wonder & Adventure Show. The title is spot on, as this one-hour episode is a thoroughly entertaining and far-ranging discussion. And like The Blue Lamp, this is no typical podcast, but an imaginatively designed (and frequently hilarious) radio show set in the windswept Dream Tower (with a talking raven). Sign up for the newsletter (below) to be notified of upcoming events and special offers to subscribers only! And PLEASE LEAVE A REVIEW on iTunes if you enjoy the show. iTunes makes up seventy percent of the podcasting audience and the show will not continue if it does not get visible support from the listeners. THANKS!